There’s something about bread. Some people yearn for a good steak, some lust for chocolate. For me, it’s bread – that magical combination of flour, water, salt, and yeast. A corner dive with that serves pizza with a great crust will have me as a friend for life, while a 5-Star Italian place will lose me forever if the bread basked is only mediocre. Growing up, I lived in two small towns; both with large ethnic European populations. First and second generation ‘off the boat’. We had good bakeries. We had great bread. Even the grocery store bakeries managed to turn out a decent loaf. As an adult I found myself settled down in a small city smack dab in the middle of the Great Bread Desert. Here, bread is an afterthought. Not a passion. So I learned to bake. One Christmas, my wife gave me “The Bread Baker’s Apprentice” by Peter Reinhart. And it immediately earned a prominent spot among my favorite cookbooks – the go-to ones, the small assortment kept in the kitchen for easy access. A perfect combination of textbook, recipe book, and coffee table book, The Bread Baker’s Apprentice addresses the art and science of bread making accessibly, enjoyably, and thoroughly. The first third is all classroom. History, chemistry, biology, mechanics, methods, tools. Don’t skip these parts. You need them. You’ll enjoy them. Trust me. From there on it’s all action. 180 pages of recipes. “Formulas.” Bagels, Ciabatta, Pizza dough, Cinnamon Rolls, Sourdough, Challah, Focaccia. OMG, the Focaccia. The formulas are easy to understand and come with helpful tips and commentary. Ingredients are listed by both weight and measure. Each recipe comes with tips, commentary, and photos that will make you want to get busy baking. Armed with The Bread Baker’s Apprentice, good ingredients, and a basic set of tools you will be turning out professional quality breads in no time at all. Impress yourself, impress your friends, eat well, enjoy the journey. The Bread Baker’s Apprentice is a Good Read. 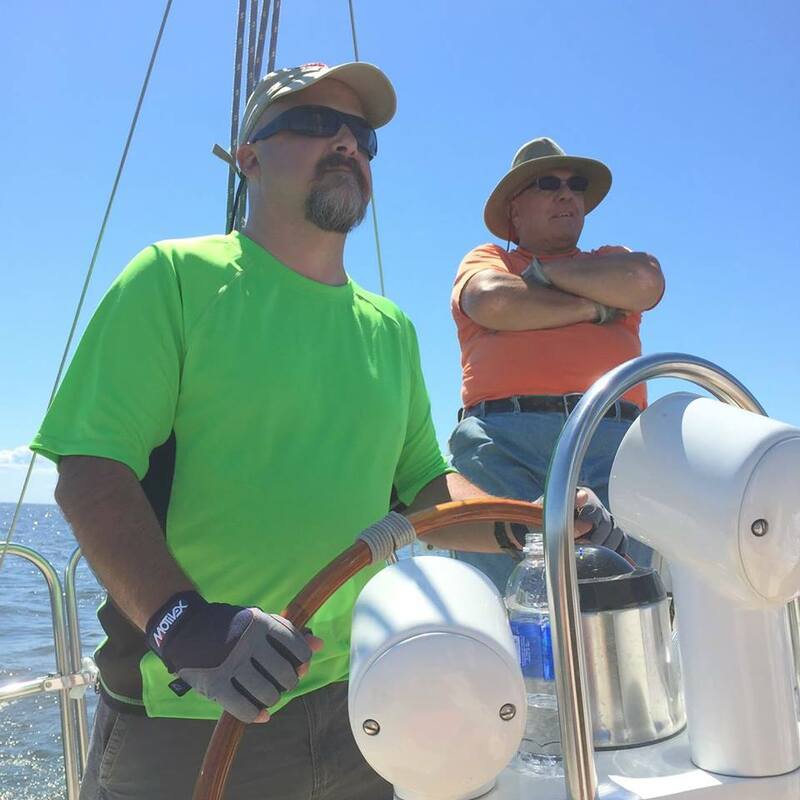 Way back in October, I was sharing stories of my first season sailing and club racing with my friend Norm. An avid sailor himself, Norm was more than happy to share a few stories of his own and soon an otherwise boring afternoon at a trade show was enjoyably put to rest. The next day, Norm came by our booth and invited me to help sail his 41′ Morgan from Daytona Beach to Ft. Lauderdale to get it in position for the Fort Lauderdale to Key West race in January 2016. As a neophyte sailor I jumped at the opportunity to do some open ocean sailing and learn from an experienced skipper and crew. That was October. It’s December 31 and the reality of this trip is starting to look and feel a lot more real. As I lay out my gear for this first offshore sailing trip the feelings of excitement and nervousness are about equally mixed. Do I have the right clothes and gear? Will the night sky 20-miles off shore look as amazing as I imagine it will? Will seasickness rear its ugly head? Will I learn some things that might help my sailing friends back home? Will my snoring make the rest of the crew want to rig a plank? The last few pieces of gear – boots, PLB, safety tether – are on their way. Careful preparation is turning nervousness to caution and caution to confidence. I am excited for the trip. Eager to get back out on the water. And grateful for the opportunity to go. Like most people, many of my best memories include food that was a part of family get-togethers, special occasions, or just every day favorites. Today, preparing and eating these foods rekindles all of the warmth and good feelings from those times. These foods weren’t always fancy or difficult to prepare but they were all delicious and designed to feed a crowd with a minimum of preparation and clean up. Of these, CHEgg Sandwiches rank among my favorites. Not sure where the recipe originated or what it’s original name was but my sister dubbed it the “CHEgg” and that name stuck. It is a perfect lap food for a football party, family event, or just to enjoy with a hot bowl of soup on a cold nasty day. They could even be made ahead and heated up in the boat’s oven to give the crew a hot meal without the cook having to spend much time below decks. Combine all ingredients and spread on hamburger buns. Wrap in foil and bake at 375º for 15 minutes. Serve hot and enjoy! As I mentioned in my previous post, I’ve been bitten rather hard by the sailing bug. After the lessons at Jolly Roger Sailing Club I started crewing on a couple of boats for various club races and, well, the downward spiral into addiction has only picked up speed. After mounting a sustained campaign of reasoning, arguing, cajoling, and begging; the other two Jays have finally given into the fact that I will not be deterred. And I am now in the market for a sailboat. A used sailboat. An “older” used sailboat. The good news is that most production boats made from the early 1970’s on are made of fiberglass which, if properly cared for, will last nearly forever. There are plenty of 30 and 40 year old boats out there with many years of life left in them at prices that make ownership affordable for about anyone. The bad news is that there are plenty of 30 and 40 year old boats out there with major problems and telling the good from the bad isn’t as easy as you might think. It is important to arm yourself with both allies and knowledge in the search for that perfect boat. The best move I made was to join a boat club. Sailors are known for being passionate about their sport and generous in their support for each other and for newcomers. For me, the friends I made through Jolly Roger Sailing Club have been my biggest asset. Find a club, get active, make some friends, do some sailing. You won’t be sorry. The second best move I made was to pick up a copy of a great book by Don Casey called Complete Illustrated Sailboat Maintenance Manual. If you are in the market for an older sailboat, already own a classic, or just enjoy nerding it up with a little light reading on how to maintain a marine diesel engine; this not-so-little gem deserves a spot on your bookshelf. A compilation of six separate books, Don Casey’s Complete Illustrated Sailboat Maintenance Manual covers all aspects of inspecting, maintaining, and repairing sailboats. Don’s book goes into great detail on what to look for when assessing a used boat – from how to remove your rose colored glasses to a succinct “Boat-Buyer’s 30-Minute Survey” that provides a method to quickly weed out junk boats and identify solid candidates that merit a more in-depth assessment. For current boat owners, this book is a one stop shop for troubleshooting and making repairs on all major boat systems. My search for the perfect boat goes on. With the help of experienced sailor friends and the knowledge gleaned from Don’s book I go into the process much more confident and well equipped to find my great old boat. Sailing! After ten years of dreaming about it and ten years of putting it off I was finally able to take sailing lessons. The opportunity came in the form of a Craigslist ad for an Adult Sailing Program at the Jolly Roger Sailing Club in Toledo, OH. For only $125 (total!) 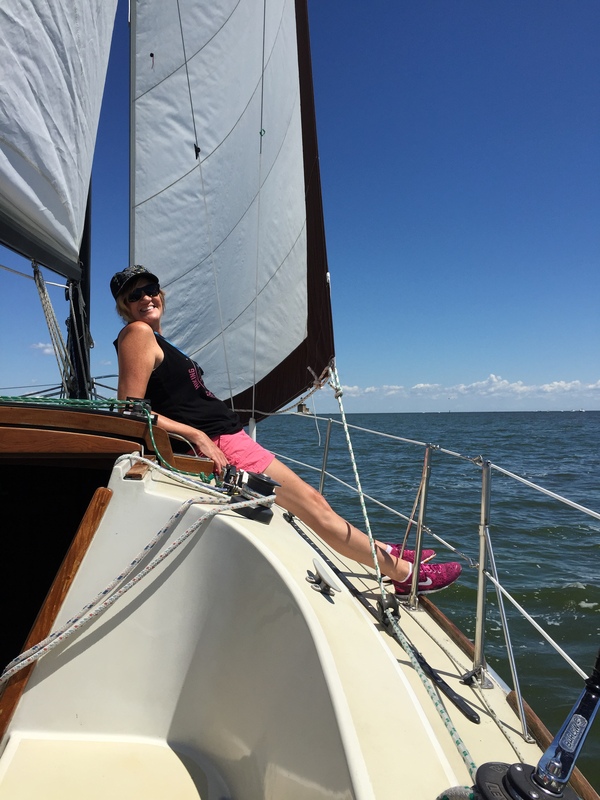 the Three Jays could get an introduction to sailing that included one class room session and six hours of on-the-water, hands on lessons from an experienced member of the club. I’ll admit to being a bit nervous the first time we went to the club. The very thought of a “yacht club” evoked images of Bushwood Country Club – high society stuffiness and “pinkies out” etiquette. What we found was a warm welcome by some of the friendliest, down to earth people you could imagine. 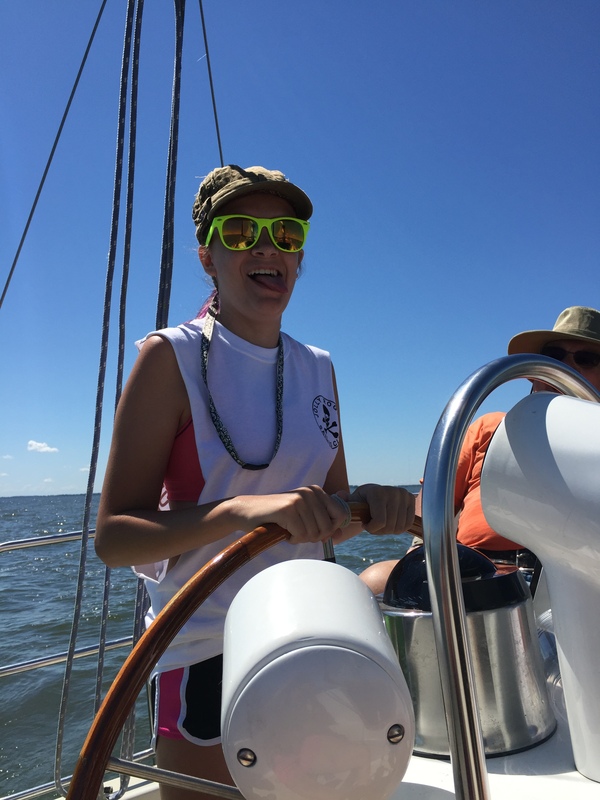 The primary purpose of the club seems to be about members sharing their sailing knowledge, promoting the sport, and enjoying the company of fellow sailing enthusiasts. We felt right at home. Me at the helm under Bill’s watchful eye. Phil, JRSC’s Membership Chair, led the classroom session, which was about 90 minutes focused on safety (wear your PFD), boating rules of the road, and a fun knot tying exercise. Many club members were there to help out and to get to know the students. At the end of the classroom session students were paired with an instructor for the “on the water” portion of the class and left to make arrangements to get out and do some sailing. The day of our first sail came as slow as Christmas did for young Ralphie Parker and I was every bit as excited, impatient, and nervous as he was. But finally the day did come and we met our instructors, Bill & Judy, at their 30′ Ticon Magi. We hadn’t met Bill & Judy before but found them to be, like everyone else at JRSC, warm, welcoming, and a lot of fun. Over the course of the next month we sailed with Bill & Judy three times. The first session covered the basics: safety, raising the sails, steering and trimming for various points of sail, tacking, jibing, and bringing the boat safely back to the dock. The next two sessions built on the first with drills that refined our skills and built confidence. 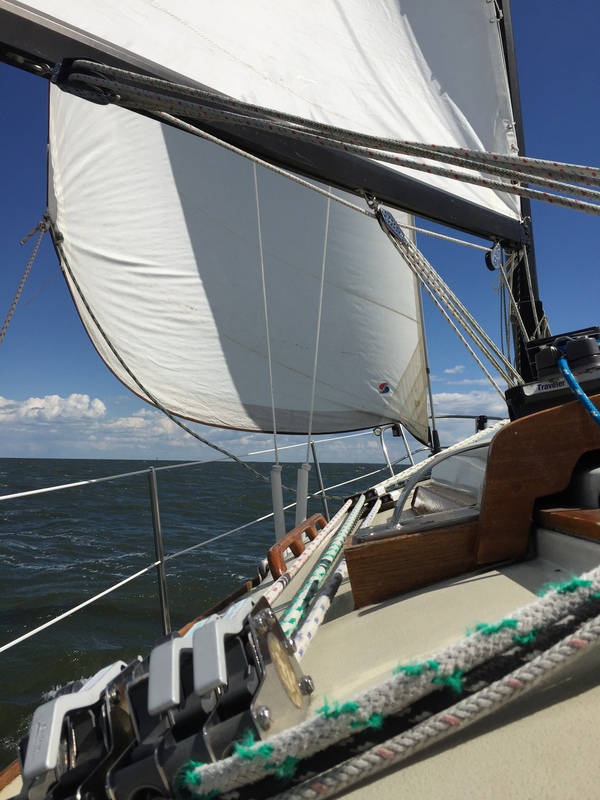 All this and some absolutely lovely sailing in the western basin of Lake Erie. The program culminated with a “graduation” ceremony at the JRSC clubhouse where we were treated to “Pirate Burgers”, a trivia contest, and a whole lot of good company. The Jolly Roger Adult Sailing Program was a positive experience at every touch.So much so that we are becoming members of the club! In addition to the adult program JRSC offers a junior program that is known as one of the best in the area. The focus for the juniors is to build basic skills while having fun with opportunities for competitive racing when the time is right. Jess was able to go out with them a couple of times before school started and is looking forward to taking it up again next summer. If you are interested in dipping a toe into the world of sailing, Jolly Roger Sailing Club is a Good Place to go.